Central banks are funny places. On the one hand, as the overseers of fiat currency, they enact the monetary policies and other currency manipulation schemes that exert such a harmful effect on the intrinsic value of cash. On the other hand, they reserve for themselves the right to hedge against the negative effects of those same policies! They do this by purchasing the asset known to protect portfolios against the ravaging effects of elastic currency manipulation: precious metals – specifically gold. And did they ever purchase gold last year! 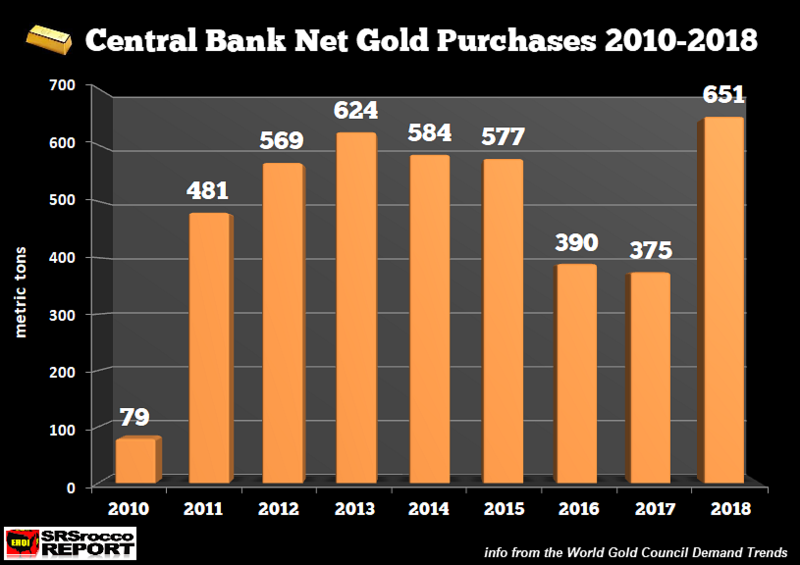 According to a recent article at Forbes.com, central banks bought an astonishing 651.5 metric tons of gold in 2018. That’s a 74% increase over the amount they bought in 2017. For some additional perspective, it’s the most gold purchased by central banks in one year since President Richard Nixon removed the dollar from the gold standard back in 1971. As a matter of fact, in the volatile final quarter of 2018, central banks purchased 195 metric tons of gold which turns out to be the most ever purchased by central banks in a single quarter. This behavior by central banks has great relevance to “average” investors. Plainly stated, if central banks, of all places, so enthusiastically turn to gold to protect their own portfolios, then maybe everyone else should consider doing the same thing. For some nations, such as Russia, the effort to stock up on gold has a dual purpose – to not only have on hand more of the safe-haven asset to protect against a volatile global economic climate, but also to continue the process of liberating itself from the dollar and the U.S. global economic hegemony. Most of the central banks involved in the gold-buying frenzy are the central banks of nations with emerging markets. To be sure, some of them also are interested in “de-dollarizing” because they too are targeted by U.S. sanctions – Turkey and Iran, for example. No smart investor wants to own mere “economic energy IOUs.” Check to see if your portfolio is composed of largely – or even entirely – of stocks, stock mutual funds, and/or exchange-traded funds (ETFs). If it is, you’re particularly vulnerable to threats such as those noted above. As I said earlier, if central banks that have so much at stake are looking to gold to defend their portfolios, maybe you should do the same thing. If you can’t presently count gold among your assets, call Augusta Precious Metals at 855-242-4121 and speak with one of our dedicated gold and silver professionals. And if you’re interested in learning how you can further maximize the benefits of owning gold (and silver) by purchasing it inside a tax-advantaged IRA, be sure to ask the Augusta team member you speak with about that, as well.